Every year the Louisiana History Museum creates a book or DVD to showcase the rich history of Central Louisiana, and to raise operating funds for the Museum. This year, in 2010, the Museum is proud to offer a 16-minute DVD about the historic Hotel Bentley! 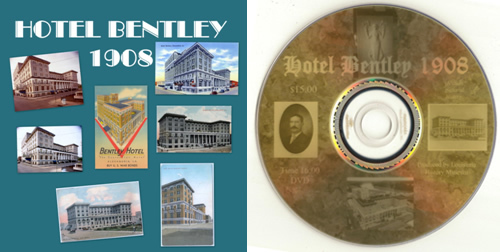 The DVD features a pictorial history of the Bentley Hotel from its beginning in 1908 till now. See the hotel as it looked when it was constructed. View photographs of the Bentley’s self-contained electric plant, ice plant, print shop, wine cellar, kitchen, ball rooms and all the original decorations. View the splendor of its original interior. Hear for the first time in over 100 years“The Hotel Bentley March”, a composition by Carlos Greig, which was played at the grand opening. Louisiana History Museum operating fund!